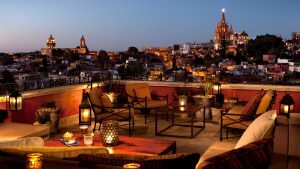 Why Visit Mexico? 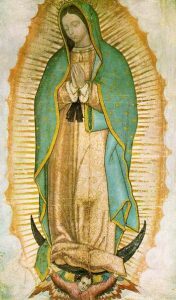 Why Visit Guadalupe? Is it Safe? Join us! Let’s deal with the big issue first: IS IT SAFE? First, we would never take pilgrims anywhere that is not safe. We have done this tour of Mexico a number of times and it has always been perfectly clean, safe and friendly. There is a lot of bad news in the media about Mexico, but every country has bad areas. Second, we do not go anywhere near areas that are the least bit a problem. We have the best of guides and agents who know the country well and we are in very good hands. So YES, it is safe – and clean. We stay in unbelievable amazing hotels and eat some of the best good that we have on any of our pilgrimages. Mexico is an amazing country, with a fascinating history. It also has extremely friendly people, a vibrant Catholicism and some of the best hotels and restaurants we have ever visited. Christianity first came to Mexico’s shores and we renew our baptismal vows in the first baptismal font in the New World which was brought from Spain by Cortez. We will discuss the Cristeros and the problems the Mexican people faced when their religious liberty was stripped from them. You will be proud to be Catholic when you understand the story of Mexico, see the sites and meet the local Catholics. We spend time at Guadalupe with a professional tour, Mass in front of the Tilma and free time to pray and wander the grounds. 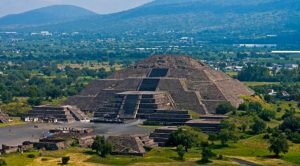 We also visit the magnificent Cathedral in Mexico City, the Pyramids of Teotihuacan and the Aztec Temples. At each site we relate everything to our Catholic faith. Man, the Controller of the Universe.” Steve will debate him in front of his mural. Fascinating! This is truly a fun, diverse, safe and exciting cultural and Catholic adventure. 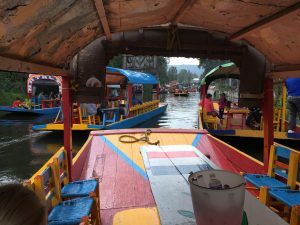 Below see pictures of the Pyramids and the gondola rides in Xochimilco. To watch a 15 minute video of each day from our last trip to Mexico, click here and scroll down for the videos. To see our interactive map and itinerary, click here. To see the brochure for December, click here. For more info please contact my associates at Corporate Travel at kripley@ctscentral.net or at ? (866) 468-1420?. 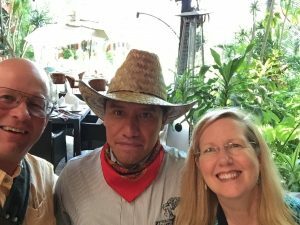 LISTEN TO WHAT OUR PILGRIMS SAID ABOUT OUR LAST PILGRIMAGE TO MEXICO! !